Isolated Vision | Arts and Culture | Style Weekly - Richmond, VA local news, arts, and events. Photographer Jack Jeffers took "a hard right turn" when he discovered the people of Appalachia. Examples of his work, such as "Mountain Man" (1972), can currently be seen at the Virginia Historical Society. Jack Jeffers got started documenting the weather-beaten people and structures of Appalachia by accident. "The day that I walked into the backwoods near the south fork of the Tye River in western Nelson County and discovered an old mountain family living as they might have lived 200 years ago," Jeffers says — "my photography took a hard right turn." "End of an Era: the Photography of Jack Jeffers," at the Virginia Historical Society, features 23 large-format, silver sulfide prints all hand processed and framed by the Farmville native. Next to each of the prints are excerpts of stories Jeffers shares about what he saw in Virginia's Blue Ridge region in the late 1960s, '70s and early '80s as he made his way through the area, documenting and getting to know its residents. "Jeffers presents environments that sometimes startle us with a sense of isolation that is unknown in today's world of cable television, internet, and smart phones," says the exhibit's lead curator, William Rasmussen. 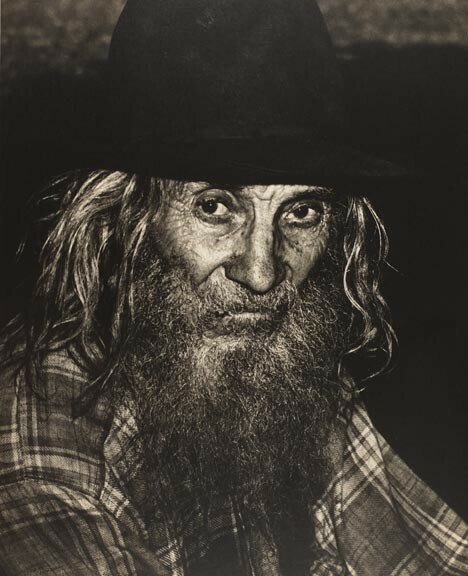 Referring to the show's linchpin image of a mountain man named Cyrus, Jeffers explains: "It took me a good year and several return visits before Cyrus would allow me to make a photograph of him, but in the meantime, I had started to work on what turned out to be a major documentary, because one photograph of a mountain dweller led to another, and I realized that what I was working on would soon become history. "I knew in my mind that these people would not be around much longer and my interest in this venture turned from a job into a passion." The photographs document not only people living in an isolated world, but also old ways of life, such as the last of the old menhaden fishing boats in Reedville. Many images feature snowy landscapes, another favorite target of Jeffers' lens. "First, I love snow for the sake of snow," Jeffers says. "But for my art, it becomes extra special. It blots out a lot of terrible distractions such as trash, power lines, and other manmade objects, everything from old cans and bottles to junk car parts, that distract from the meat of the simple subject, the concept. Snow reduces a landscape to the lowest common denominator." Jeffers gave away all of his lab and film equipment in 2005 to enter the world of digital photography, but acknowledges that it lacks something. "I am having a ball with it, but there is something missing," he says. "I miss the lab and watching a fine silver image come up in the developer. This project was truly a hands-on operation and there were so many variables that depended on the human eye and pure gut feeling." It's his eye and gut feeling that define the historic photographs in the show. "And while I love making pictures aided by modern digital technology," he acknowledges, "my heart is still with the old-fashioned processes that are slowly passing into oblivion." "End of an Era: the Photography of Jack Jeffers" runs through Aug. 26 at the Virginia Historical Society, 428 N. Boulevard. For information, call 358-4901 or visit vahistorical.org.